1) You're such a good friend! 2) How could you just pick up and leave like that? I was nothing like a good friend, and I could only pick up and leave like that because the thing I was picking up and leaving was no longer, in any recognizable sense, a life. But I don't say this. My conversation self, the one I send out to bars and parties and weddings, is a half-truth-spouting machine. Here I'll try to do better. I enjoy stories that use the act of story telling as their artistic device. 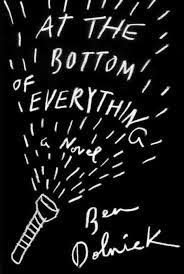 It's an invitation to the truth, and there's something fitting about this artifice in Ben Dolnick's plainly voiced first-person confessional narrative in At the Bottom of Everything. This is a classic novel of a close male friendship that grows apart as the friends age. For Kings and Planets, Narcissus and Goldmund, and Brideshead Revisited all fall into this classic category, which evokes for me a certain nostalgia, but each is also a tragedy. Innocence dies a terrible death in each of these stories. At the root of the distancing in this novel is a terrible accident in which Adam, our narrator, and Thomas are complicit. Dolnick evokes a time in the life of Adam during which life seems to just happen to him. Perhaps because he was a childish adolescent when the accident occurred, or perhaps because seeing himself without agency is the only was he can tolerate the act he participated in. Neither boy is equipped to handle their guilt, but instead of seeking help they become secretive. Adam spends a number of years making choices in life that are self destructive. Adam's conflicted attitudes towards the accident end up splitting him in two - one person who wishes to be responsible and one who can't stand to think about it, one who wants to stay in touch with his old friend and another who wants to avoid him. Dolnick captures this duality beautifully. On the other hand, Thomas reaches a point where he can only move toward what happened and deal with it, traveling all the way to India on a spiritual quest, to do so. This part of the novel evokes another classic genre - the character who sets out from a world in which he cannot find his place to seek meaning - The Razors's Edge comes to mind. Both these men become defined by this act but At the Bottom of Everything lives in the duality of their responses asking - whose is healthier, whose more ethical? Your post reminds me that there were things about this book that I liked despite my review to the contrary. I found the opening chapters quite engaging. I actually loved your negative review of this novel - it was enthusiastic!